Great lake views from this gorgeous, like brand new custom home on a quiet cul-de-sac are sure to wow! 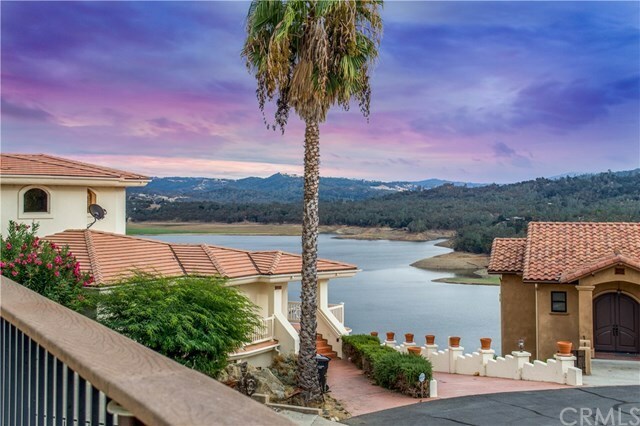 Expansive solid floor decking with Trex railings provides ample space to relax and enjoy the endless views of Lake Nacimiento after your day on the lake! The open floor plan kitchen features concrete counter tops, a wine fridge, tile back splash and a gourmet kitchen with custom alder cabinets and a full GE stainless steel appliance suite! Open great room with vaulted ceilings, gorgeous views, beautiful distressed oak floors and a stack stone surround gas fireplace combine to make a great gathering space for friends and family! The Master bedroom includes access to the rear concrete patio which is wired for a hot tub as well as a large en-suite master bath. Three guest bedrooms including an additional master suite for plenty of flexible sleeping to ensure ample space for all your guests! All three bathes as well as the laundry room are full bathes with a combination of Travetine and porcelain tiles each with its own design. Don't forget the extra deep (40 by 36 foot -1500 sq.ft) with 2 nine foot doors 4 car garage for all of your lake toys! Home was designed to be low maintenance with composite siding, complete exterior ground cement perimeter and 4 X 6 construction for optimal insulation. And did we mention you are just around the corner from the west ramp? The 22â Essex pontoon boat, the golf cart and furnishings are negotiable! Directions: In Oak Shores, right onto Oak Shores Drive, left onto Saddle Way, left onto Deer Trail, right onto Pronghorn.